Heat half the oil in a large frying pan over high heat. Add the haloumi and cook for 1–2 minutes, turning, or until golden. Remove from the pan, set aside and keep warm. Add the remaining oil to the pan, add the radicchio and cook for 2 minutes on each side or until charred. Pour over half the balsamic glaze, add the pears and cook for 1 minute or until just warmed through. Remove from the pan, set aside and keep warm. Add the lentils to the pan and cook, stirring, for 2 minutes to warm through. 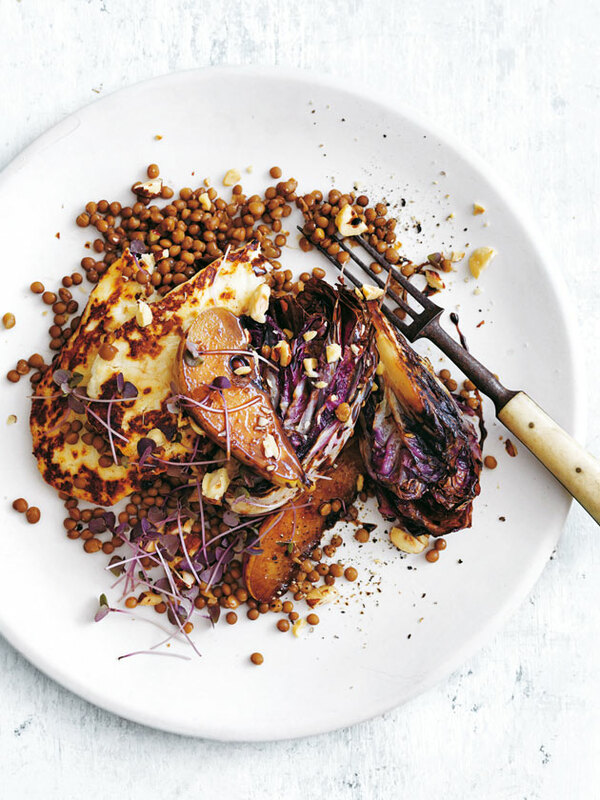 Divide the lentils, radicchio, haloumi and pear between plates. Top with the hazelnut, remaining balsamic glaze, salt, pepper and basil to serve. Serves 4.